"You aren’t spoon-fed like you are at school and the independent reading you have to do prepares you well for university." Trainee solicitor Alexandra Wood initially chose to go to Derby College because it offered A level law and her school sixth firm didn’t. And, as Alex had hoped, going to college also made her much more independent and better prepared for life at university. After taking GCSEs she was ready to leave school for good and felt that Further Education college was the best option for her. Alex, who is 24 and from Oakwood, describes her time at Derby College as the best two years of her life – even better than being at university. She made lasting friendships at Joseph Wright and came out with the A level grades she needed to study law at Nottingham Trent University, Including an A* in law. Alex graduated with an LLB (Hons) degree in law then went on to take her Legal Practice Course (LPC) at Nottingham Law School , for which she was awarded a commendation. 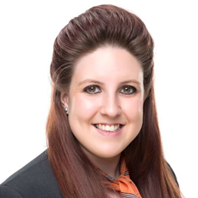 Now eight months into her training contract with law firm, Shacklocks LLP, Alex is gaining experience of different departments before deciding in which area of law she’d like to specialise. She is currently working with the Family team in Shacklocks’ Belper office, and enjoying it very much.